So that’s what I did! 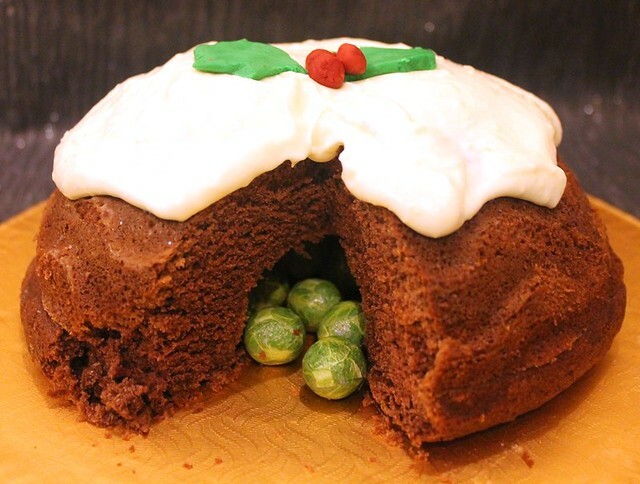 And the end result: cake that looks like a Christmas pudding, with a hidden sprout ‘treat’ lurking inside. One Lakeland Pinata cake tin (or you could faff around with some other kind of tin and middle of cake removal process if you really wanted to) greased and lightly floured. 1 quantity of cream cheese icing (125g cream cheese mixed with 250g icing sugar and 1/4 tsp vanilla extract. Add a splash of milk if not runny enough to slide down the pudding cake slightly). Cream together the butter and sugar until light and creamy, then gradually beat in the egg. Add the cocoa mixture and vanilla extract and beat until mixed. Sift together the flour, salt and bicarbonate of soda, then add half the buttermilk to the mix and fold it in before adding half the sifted dry ingredients and folding those in too. Fold in the remaining buttermilk and dry ingredients. Add the white wine vinegar and mix until just combined. Spoon the mix into the pinata tin, stick it in the oven for 20-25 minutes until it bounces back to the touch. Wait til it’s cooled, remove the pinata hole making bit from the tin and fill the hollow with chocolate covered sprouts (or whatever you’re hiding inside) and then place whatever base or plate you are using over the top of the tin before flipping it over to let the cake come out. (If the cake is having trouble coming out, flip it back over and gently loosen the sides with a soft spatula and then try again). Add the cream cheese icing over the top. Decorate with ‘holly’ made from green and red fondant icing, or a fake (or real!) holly sprig.